I had bought a pair of these boots quite a few years ago and wore them every day. They fit comfortably from the time you put them on til they wear out completely. I am so glad I have been able to replace them with the very same boot and will be ordering another pair as well. Double H knows how to make a boot I own several pairs of them the 1552 is my favorite USA made and made well ! Best work boots ever!!! Have been wearing these for over 10 years. No break in time needed. They will last for a couple of years. You will have a tough time discarding your older ones as they will double as slippers. Great boot. This is my second pair, they wear like iron ! Very comfortable, nice insoles. Always order them for my two sons. They won’t wear anything else. I have bought and wore Double H boots from Shoeline for many years. I do not wear anything else. I try to keep three pair for dress, work and the oldest for rough outside work. They are comfortable, tough and look great. I have been getting my boots from Shoeline for quality, fast, accurate service, no tax and free shipping.I would not go anywhere else. Thanks! Over the years Ive purchased multiple styles of Double H boots and every one of them have fit perfectly with no break in period. I highly recommend their slip-on work Western boots for every day use. Great boot. Fit smaller than a regular boot in my opinion. Double H boots sizes are off. Size I wear everyday and have worn for years is now so tight I can not get my foot into the boot. I now ordered a half size larger and 1 size wider. I can now get the boot on. Length and width of the sole and heel (same boot) are the same.Old boot I am wearing 10.5 2E. New boot (same model) 11 3E. i go through a pair of boots every 4 to 6 months . Ive been dealing with these folks for quite some time. My boots have all been exactly what they said they were. I wear double H work boots . excellent service... fit and overall happy with the purchase and the boots. Looking to order again soon! My third pair of this style. All outdoor farm and ranch work. Pretty much says it all. The bad news is that I had to send 2 pair back before I finally got a size that fit comfortably. The good news is that the pair I kept fit very comfortably and the exchange process was very easy.I bought 2 pair of boots at the same time (different brands but same size). The Carolina work boots I bought fit great right out of the box but these boots were longer and narrower than the Carolina's and it took me several tries to finally get the size right. For me, these boots ran longer and wider. But I've been breaking them in and they feel very comfortable now and more so every day. the quality appears to be great and I am very happy with the purchase.These are the first shoes/boots that I ever bought on-line. Exchanging these boots multiple times was no problem. Replacement boots came within a week. Everything was smooth. Very happy with the boots and service. These are great boots my husband loves them and is not gentle on them in the least bit very durable boots. These boots came exactly as described and look awesome. Wear better with a thicker wool blend sock. Very comfortable right out of the box! These are wonderful boots - Wore them for 12 hours the first day. The fit was very good and there wasn't any heel slipage like you get with some new boots. Very happy with my DH1552 gel oak ice boots. Toughest work boot ever. This is my third pair of Double H boots. Both my husband and Dad have this boot. They just love how it's comfy right away. Had many pairs of these boots over the years. Either my foot is growing or the sizing is shrinking. Well constructed, sturdy, American made boots. Breaking in nicely after several days. I anticipate years of service. Would have rated "5" if vamp were leather lined. i have tried other boots from time to time but always go back to Double H. They are comfortable and wear very well. no complaints and I have worn them for probably close to 20 years. Got these for my son for Christmas. They arrived within a couple of days and he loves them. Thank you! 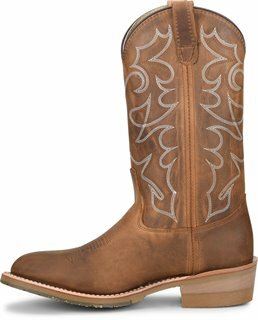 I ordered these boots for my dad for work. They arrived on time and were the quality expected. About to order my third pair in 6 years, tough, rugged and molds to my foot wonderfully!! A little pricey, but other than that, a nice pair of boots. Love the boots most comfortable pair I've ever bought. My father works in construction and he has wore boots for over 45 years doing so and he said these are the best. Definitely recommend them! These are some of the toughest wearing boots I have ever had! I spend a lot of time on my feet on construction sites and they hold up extremely well. I would definitely recommend them to anyone. Great Job! I love these boots. I have had them about a week and must say that they are the most comfortable boots I have ever owned. It is my second pair of Double H boots and these are top quality. I would still be wearing the first pair that were 10 years old if my lovely bride had not given them to my son. I won, because the gel insole in this new pair are much more comfortable. Shoeline did a great job and delivery was right on time. double H is all I wear any more. Ive had the Red wings and wolverines. double H boots outlast all of them and they do it comfortably. My second Pair in 5 years, Nothing wrong with the first pair, its weather nicely, but just needed an extra pair to keep @ the ranch. Made and the USA, Great Price and fit like a glove! Thanks Double H,You rock!!! Great boot it lasts a long time. I think fits a little tight at first but break in is painless and smooth. I work on my feet 12 hours a day. I'am a welder and it holds up really good to my everyday work. This is the second pair I have. The first pair is 1 1/2 years old just had new soles and heels put on uppers are in good shape. After 3 trys I finally found the boot that fits. They are comfortable and appear to be well made and functional. Recieved the boots I ordered in the size I ordered them in. Great boot comfortable good looking and lighter than other workboots. Best of all Made in the U.S.A. and is leather lined to boot. Ha Ha. Great boot fits like a slipper. Double H boots are the best. The break in period was a bit longer than advertised. The toe area begins being uncomfortable after a few hours of physical labor. Probably won’’t wear them as full time work boots but they will definitely be my small job/going out boots. Favorite pair of work boots Double H makes a quality boot. I’’ve been buying and wearing these boots for about 5 years and they are perfect I really love them. I’’ve tried many different boots in the pass and nothing matches the double h’’s. They are Very nice boots. Easy return system to finally get the right size. Very quick tun around. 4th pair for my husband...just wish the heel didn’’t wear out so fast. We buy boots every 6-9 months. I bought these boots for my husband for Christmas I ordere his size we sent them back three times he ended up getting one 1/2 size larger than he normally wears from an 11 2E to a 12 3E. He couldn’’t even get his foot in the 11 2E. Once we got the right fit he loves them. Awesome boots. They look great and they are very comfortable. I love the boots. I have very hard to fit feet. My left foot is larger than my right. I have had success only with European sizes size 49 because their cut is more precise. However these boots are cool and I have been wearing them almost every day in the New York summer heat walking regularly with the boots. They breath well as my feet are not sweating. I am considering purchasing a black pair of Double H boots too. Great service from shoe .com and its nice wear a boot made in the USA. Great boots and very comfortable. Superb US craftsmanship. From the superior foot bed to the quality of the leather and sole this boot is among the best I own. I have a few pairs of Double H boots - like them all a lot - but this one stands out for comfort and class. Shoeline - dependable as always - had them at my door in a matter of days. Great companies both. This is the 2nd pair of DoubleH’’s I have purchased. The other pair is 5 yrs old and they are the same as the day I got them. These new ones fit and look great. Very soft upper inside and out. Break in time will be short. boots arrived promtly and fit great. Very pleased with the custoerm service and will use Shoeline again. The DH 1552 is too narrow I could not keep th on At work had to go to walmart and buy shoe’’s. And wanting to charge for restocking is crazy.NO I WOULD TELL A FREND TO BUY YOUR BOOTS. Shoeline has always been a good experience. This is the second pair of this particular boot. Wears well and comfortable. Wish you would make more "B" widths and a more rounded toe. HH makes a great boot have used work boots from them for at least 18 years. Upper of boot seams a little small but happy with purchase. Fits like a good boot should. Took a bit to conform and break in but is super comfortable. Plus it is made in the USA not china. I originally bought a half size smaller boot. I returned them and hot the next size up and the fit was perfect. The process of returning the shoes went very smooth and quickly as they pay for shipping for exchanges and before I knew it I had my new pair of boots. I must say the boots are true to size and I love the way they fit now. Thanks. This is a very well made boot. It was shipped to me quickly after I placed the order. I would recommend this boot to others as well as ordering it from Shoeline. I am very happy with the way the boot fits and is very comfortable too. Great Boot Shipped right away My New Boot Company. Easy fast and efficient on line shopping. I was very impressed because it was the week before Christmas. Great looking boot and my son said they are very comfortable. I like the boots and the company. The person on the phone helped me change my order with no problem. Thanks for the service. I could not have made a better purchase. Shipping was quick too. I’’ve owned a pair of these boots before very tough and durable. I’’m a lineman and I’’m very hard on boots. I will buy them as long as they make them. These boots are very comfortable to wear. I’’ve owned alot of top brand boots. These Double H boots are the most comfortable boot that I have ever owned. If you are on your feet or walk alot these boots are great. They hold up to the weather. DELIVERY WAS FAST WITHIN 3 DAYS AND ACCURATE. WILL ORDER FROM HERE AGAIN. Item was shipped fast and boots fit great. These Double H boots and the ordering of the product were both very satisfying. This is the first pair of Double H boots that I have ever bought. They fit well from the first day and have been comfortable ever since. They did not need breaking in like a lot of other shoes and boots. I will buy Double H again. The Double H boots are the best boots that I have ever worn The work western feels like your wearing tennis shoes. Double H Boots are hard to beat. My husband no longer has the foot pain he had while wearing other boots. He puts a lot of wear on them and they stand up better than most. I’’ve worn a lot of boots over the years but none compete to these. My 2nd pair of Double H boots and it won’’t be the last Nothing more comfortable and I constantly get compliments on the looks. Very comfortable and good wearing boot. New Double H fan and will buy more of their products in the future. Ordered boots on 1st and received on the 15th. excellant merchandise and fast service. have bought boots here before and that is why we came back. it was very easy to order. the boots came very quick.